Our pets are simply the best, and summer is an excellent way to get them outside. We want them to enjoy the beautiful Connecticut weather as much as we do, but also want them to stay safe. The last thing we want is our dog flying across several yards after a squirrel, or running off into an intersection. There are many options for finding the balance between safety and summer fun; check out some ways to keep your pet from escaping your yard with these tips from One Stop 360! There are a wide variety of fencing styles available, and all of them would be perfect to help keep your pet safe! If you want to maintain a level of privacy, invest in privacy fencing—fencing that, upon installation, is at least 6 feet tall in height. 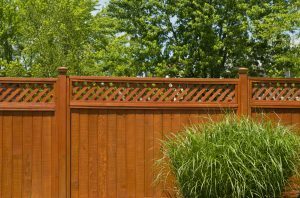 Maybe you’re wanting a fence, but without Fort Knox or the neighbor from “Home Improvement.” Look into decorative wood fencing, which can come in a variety of heights, or invest in a chain link fence. With a high enough height, your cat might even get to explore the great outdoors! There are so many fencing options to choose from, and whatever fencing style you go with will help to ensure your pet’s safety this summer. Call us to get your fencing installed today! Dog runs are similar to fences, but they don’t have to line the perimeter of your yard. If you are adamant against installing a fence, but want your pooch to stay safe outside, a dog run is a great decision. You can section off a part of your yard with however much square footage you deem necessary, and let your dog out without the concern of having them run away. If you have a pretty massive yard, a dog run can be a great investment in lieu of fencing your entire perimeter. The limited mobility from a dog run still allows for movement, but does an excellent job preventing pet escape. Call One Stop 360 for a free estimate on installing a dog run! Many dog owners love the security that an invisible fence can bring. With an invisible fence lining your yard and a small electric charge attached to your dog’s collar, your dog will learn to stay safe by remaining within the yard. Some opponents of an invisible fence chastise its use of an electric voltage to train a dog; however, a slight shock to encourage training is arguably better than the risks that come from a dog running away. 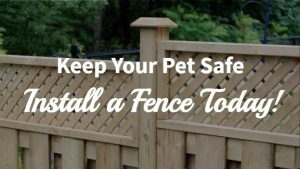 If you’re still not sure if an invisible fence is the best for you and your pet, look into physical fencing options that provide a barrier to pet escape. Through working with a dog trainer, you can help to ensure your pet’s safety by teaching them to stay within the confines of your yard. Trainers will take the time to teach your pet where to go and where to stay in the yard, thus helping prevent escape. The hope is that even when faced with those tempting chipmunks or birds, your dog will resist the urge and remember their training. There are many options to helping keep your pet safe this summer, but one of the best options is to install a fence or dog run. With a fence, your dog can enjoy the seasons without you having to worry about them staying safe. Adventure can await in your own backyard, and your pets will love to explore more freely with a fence installation. Call One Stop 360 for all your fencing needs!